One of the many dolls I recently purchased at the Theriault’s Auction weekend in Naples, Florida, was this little action Kewpie doll. He is playing the mandolin and also leaning against some books, all created in bisque. He was in a lot of five little Kewpies, all under 2 inches tall, that included an Action Kewpie holding a pumpkin (Halloween cross-over collectible), an Action Kewpie, and a Kewpie salt-shaker holding a little chick (Easter cross-over collectible). 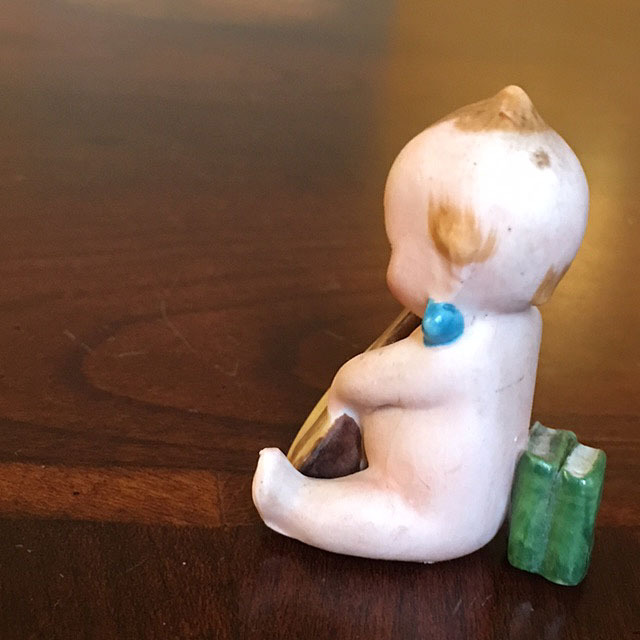 I am particularly fond of the very small-sized Action Kewpies because of my love of very tiny all-bisque dolls. Although, if you think about it, Action Kewpies sort of sneak in with the designation of “doll” because they don’t actually have any jointing. The vast majority of basic-style Kewpies do have jointed arms, and a rare few have jointed legs, and so it seems that all the Kewpies get to pile-in under the designation of “doll.” Plus, Kewpies certainly are at home being displayed within a doll collection, and the bisque ones were made by many German companies that made other dolls, such as Kestner. If you are not familiar with them, Kewpie dolls were created in 1912 by illustrator Rose O’Neill (sculpted by Joseph Kallus and distributed in the United States by Borgfeldt) based on illustrations of Kewpies first published in the Ladies’ Home Journal in 1909. The bisque dolls were made in Germany from 1912 until World War 1 stopped imports to the United States, then they were made in composition. Some knock-off Kewpies were made in Japan as well, and throughout the 20th Century many plastic and reproduction Kewpies were also made. Kewpie dolls are extremely popular and come in infinite varieties which creates some of the interest in collecting them. The bisque Kewpies made in Germany are the most popular with doll collectors. One fun thing to note: when I started collecting dolls, Kewpie dolls were Vintage Dolls; not yet quite antique since they were not yet 100 years old. 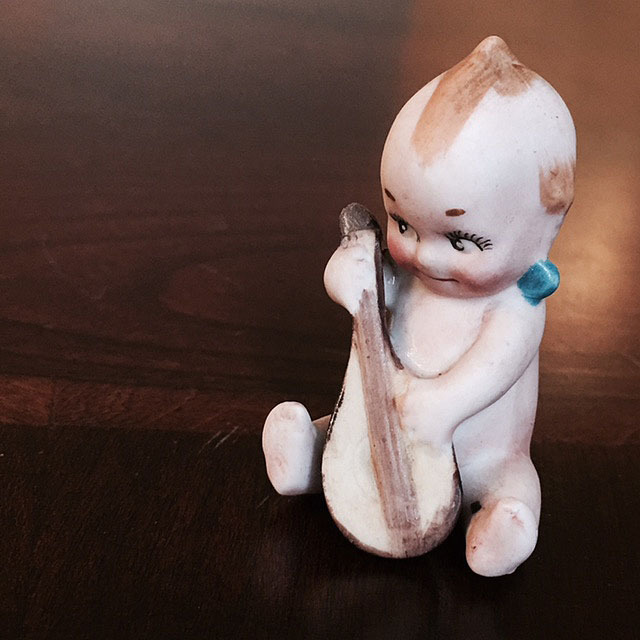 Now, many of the bisque Kewpies made in Germany are legitimate antiques, since so many were produced from 1912 to 1915. Of course, I’m not sure if that says more about Kewpie dolls or about how old I am. This entry was posted in All-Bisque Dolls, Antique Dolls, German Dolls and tagged action kewpies, all-bisque dolls, geman bisque, kewpie dolls. Bookmark the permalink.